Dilly dally – waste time through aimless wandering or indecision. Hmm. I think that definition could be improved, don’t you? Let’s see, how about: aimless wandering with little indecision as we relate outside of time. Better. Laura from Barcelona come in with some great thoughts via email and I want to quote her on this topic. Waiting for her OK. Everyone seems to be deep in thought about deep topics. We are back from the trail and we are wondering just what kind of freight train hit us. This is not business as usual but we will figure it out eventually. 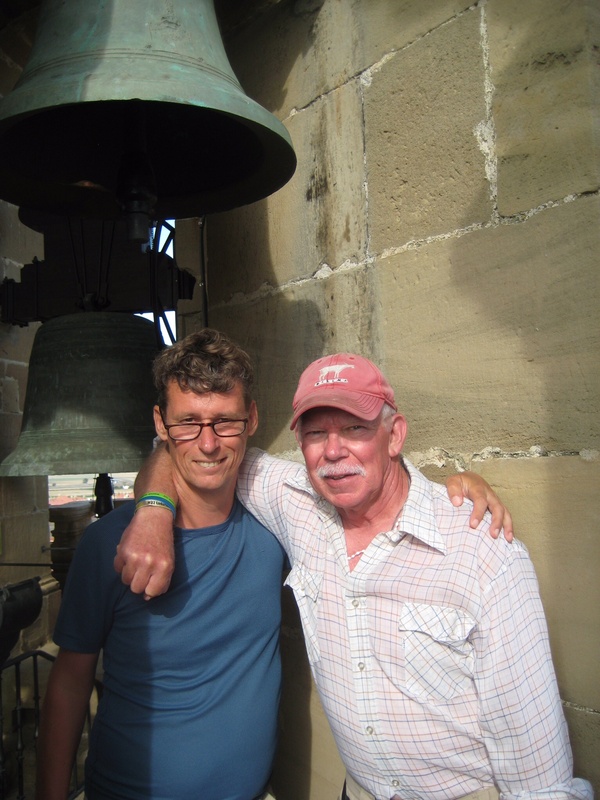 Rick, my walking partner is coming back to Seattle this evening. We are supposed to have dinner tomorrow so I will fill you in on how he’s looking. His daughter Maryka is either in Seville or is back in NYC. Kelly is with his son Michael somewhere around Sarria and are on their way to do the last 100 k.
Just a little more information: Jerome from France, Robert from Hungary and the energetic filmmaker from Italy were the only pilgrims that made it into our world after we bussed ahead from Leon to Samos. It was really sad to miss all the usual folks after we went ahead. Love you guys! OK,the sun is out and I am going to get outside to do some chores. Everything good just slightly confused lately. Yours always, love, Phil. 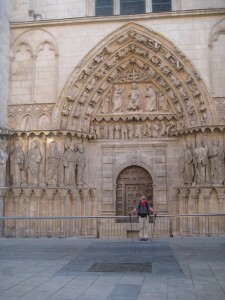 Phil at side door to the Burgos Cathedral. It’s a rainy Saturday morning and am hanging out in the quiet trying to figure out things. I know that it is not going to come all at once or that I should force things to happen at a faster pace. I know but I just don’t want it to be Paradise Lost. But we are Caminoheads, right? We keep going, that is what we do, one foot in front of the other. Part of going is recording what we do know, like taking photos along the way. What do we know? I thought of three things that I know. Not only happened but hugely happened, you know what I mean? Over the top happened in unexpected ways and at surprising moments but happened enough times where I said yes I got the message. One, my connection to the earth was vastly strengthened. 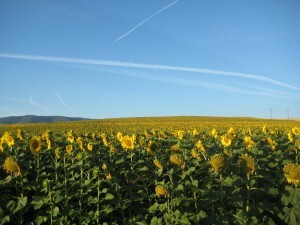 Sometimes this was the most beautiful landscape in a cloudless sky say. Beauty was over the top for sure to the point where I didn’t know what to do with it, no existing category. But yet I am talking about something else. What I am getting at is the link that we have with the earth in the way that it provides us with sustenance. Obviously, the Spanish are no slouches when it comes to agriculture, as we saw everyday. 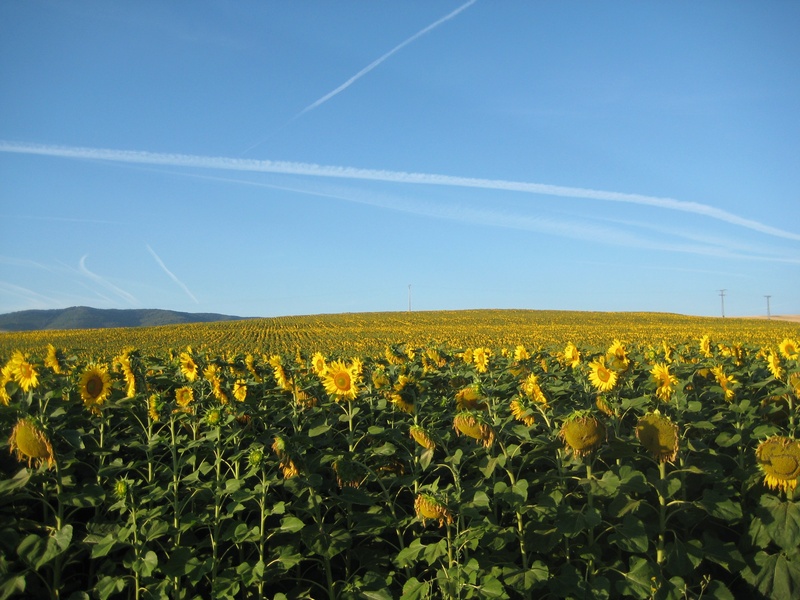 Start with the vast oceans of wheat and sunflowers that we waked through on the Meseta. And the vast fields of corn, sugar beets and potatoes that we saw along the rivers where irrigation was possible. Then there were the ever present backyard and empty lot family gardens in city and country with beans, lettuce, cucumbers and tomatoes. And the huge piles of straw bales going off to be bedding for cows and pigs. 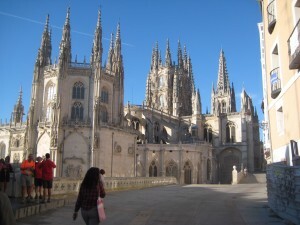 It was all very impressive and Spain must be feeding half of Europe and us as we ate in the cafés along the way. Yea, totally underestimated the power of this. Two, was the amazing connection and bonding that happened between folks. Folks from Netherlands, Italy, Australia, the States, Spain, you name it. We even had a great fellow, Sherrif, from Egypt in our group. People sharing ideas, insights, fears, you name it. People doctoring each other’s feet, sharing food, water, funds, carrying someone else’s pack when they couldn’t anymore, you name it. 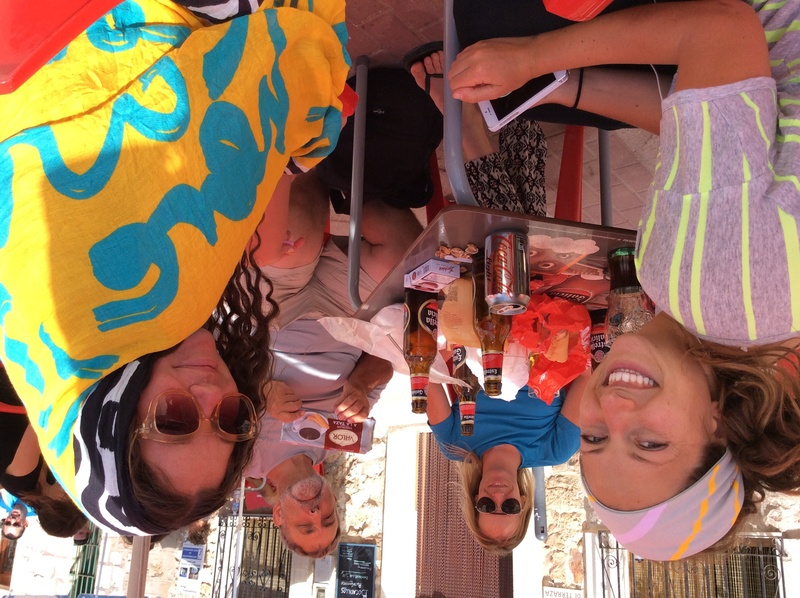 People watching out for each other as you would never leave anyone alone on the Meseta. Yea, totally under estimated the power of this. Hey, and not to mention all the situations that we got in in all the albergues with their weird bathroom and sleeping set ups. Endless variety of awkward deals. At night at least eight people snoring, at least eight people rolling over on the squeaky springs, church bells ringing all night long. I remember having one ear plug and trying to figure out which ear to put it in. It forced us to realize that yes we irritate each other at the very same time that we need each other. Third, my relationship with God was vastly improved. Not a sort of theoretical or far away feel but something close up and in the moment sort of improvement. 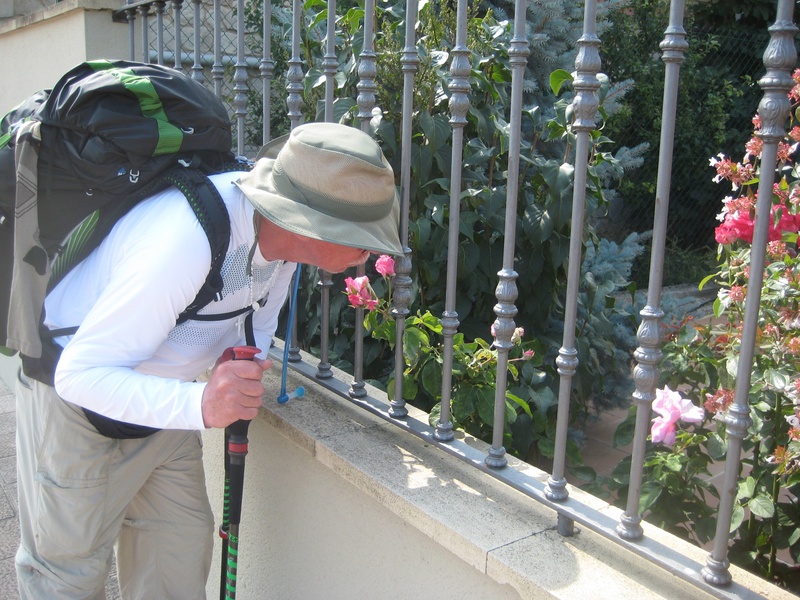 In Spain along the Camino with all the pilgrims moving there almost always is a reminder of God and his posse on a person , or fence or building or shrine or a church or hilltop. Just a sort of constant reminder that God is always present in my/our lives. Once again totally under estimating the power of this. Wrap that all up and you got a bundle. This is what I feel with the rain still coming down outside and my eyes saying how about nap time? Love you, Phil. 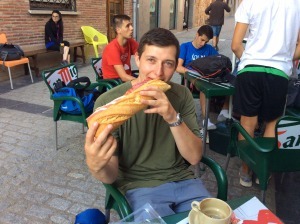 Fellow Pilgrim Eating Large Sandwich. Hi. I just want to acknowledge this wonderful young lady who has a great view of things Camino and I want to work her ideas into this blog. One of my problems at the moment is that I can’t seem to cut and paste things yet on this new iPad. Two days ago I left you with a quote of her’s that needs repeating, “It is time when all the presents that the Camino gave us will become useful.” OK, what are those presents specifically? I’m working on it, Lucia. Also she sent pix of her and her walking companions. When I met Lucia she was with two other Italian women. One was from the north, and one was from around the central area, maybe Rome and she from Sicily in the south. Total representation! Once again having technical problems and would love to get the pix over here but can’t figure that out. It’s all a work in progress, right? In one of her emails she said that she was resting and taking time so that her thoughts could have a better shape. I like the way that she had thoughts that had a life of their own maybe and given time they would show themselves in a tidy manner, lovely. I hope that I am not making her uncomfortable but this is the joy for us of meeting people from other places with a little different way to look at things and it gives us a little better view, don’t you think? Nice. OK, so I have some things to work on and explore in the coming days. But for now have to water the corn, take the paper recycling to the transfer station and jet into Seattle to the hospital. Such is life here. Love you all and keep going, Phil. Dearest ones, I am taking a break from my usual line of thought and am going to talk with you for today about something else of importance. Let me just briefly bring you all up to speed about my journey as some of you are new readers and need a little background. This is my story in short: In 2011 I was diagnosed with colon cancer. I was operated on at Swedish Hospital, Seattle to remove the tumor, a short section of my large intestine and associated lymph nodes. That was basically successful although some cancer evidence was found in those nodes. Therefore I started on chemotherapy to minimize the possibility of spreading and that lasted for six months and was brutal. Then there was some good news as I had a year off but a periodic scan revealed that the cancer had spread to my liver and lungs. That upped my stage two cancer to stage four. So that started chemo treatments for a solid year which remarkably I was able to deal with better. Part of the reason that I was able to do so is that my Oncologist replaced one of the standard drugs in the cocktail with a newer one that seemed a better fit. But also I started a new exercise program, which involved walking, with my other doc at Swedish who is a Psychologist and uses exercise as medicine. 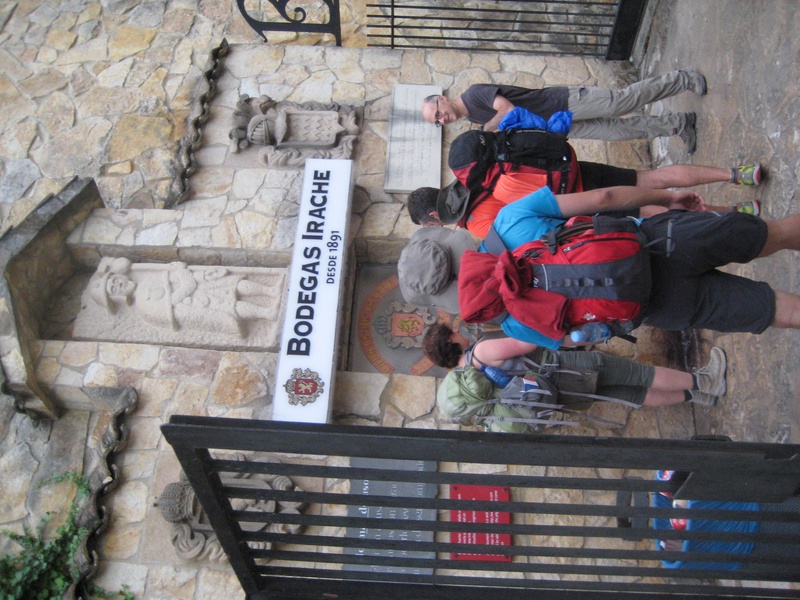 So this is where it starts to get interesting as this melded with my new fascination with the Camino de Santiago pilgrimage in Spain. No coincidences, right? My walking program with the help of my doc evolved into my own “backyard Camino” as I set up a trail around our ten acre property and began walking. 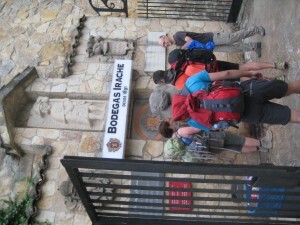 I thought about it as a thing in itself but soon doc talked about it as training for Spain and the real thing. As time went by and I got stronger and walked further by the week and some windfall money came in (no coincidences, right?) and I got the OK from my Oncologist to take a month off, and I went! Events conspired and it became a reality. Somewhere along the line the idea came to the surface to try and document the trip as a way of showing how good treatment and good rehabilitation in combination can let a cancer victim go way beyond what is thought of as possible. So yes, all of that happened as a three person film crew accompanied me and captured the journey from start to finish. And this is where you come in. I am asking for your help to get some more money raised. A Kickstarter account has been started by my team to get the project to and through the next level which is editing. This is the link: http://kck.st/1zULpa9 . Or go to the website and search for “Phil’s Camino”. If you can contribute some small or heck large amount please do. Or if you thought about it maybe someone you know that would be interested in this topic would be willing to contribute. We are getting down to the bitter end of the campaign now and need some more help. Prayers are good too, always. So, check it out and see what you can do. Thanks again for all the love and support that you have given me personally in the past. Couldn’t have done it without you, as they say. Love, Phil. Time to smell the roses. Rebecca, with the fabulous camera crew on the left. 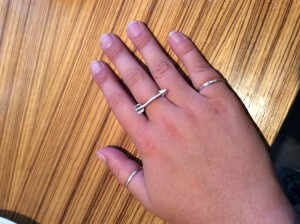 Gracie’s cool silver arrow ring. [/[caption id="attachment_425" align="alignleft" width="225"] Matthew from Netherlands. That’s what we need right now, those of us off the trail. It’s a phrase coined by Mary Margret. It’s not a happy time. Somehow we have to navigate through these rocks and shoals and make something happen. I had a post written on this topic but I just through it out. Maybe I will try a new approach. Maybe I will put my ideas in the form of questions as in what ifs. Maybe we could try things and share. What do you say? What if we joined a pilgrim organization? US has American Pilgrims chapters that have regular outings in your area to meet other pilgrims and share ideas. Other countries have co-fraternities. What if we got a lavender plant or a fragrant rose bush for our house? Or what if we got a whole bunch of them and planted them all around? Smells we all know are a pathway. What if we learned Spanish cooking? This sounds like a winner to me. And it doesn’t look all that complicated; it’s doable. And combining that with good wine or brewskis (sorry, beers). What the heck, what if we learned Spanish? Clara (a history teacher) was quoting some king from the past who said that if you want to talk about politics speak in Italian and if you want to talk about love speak in French and if you want to talk to God speak in Spanish. Sounds like a plan. Maybe French too. OK, enough of that for now. Right now I am sitting in front of a big picture window getting my chemo treatment at Swedish Hospital, Seattle. Not a cloud in the sky. Learned that my scan yesterday showed that the spots that I have are unchanged and there is nothing new so that’s a good thing. So today is the first treatment in a new series of twelve treatments, six months worth with the same drugs as before which is keeping the cancer from spreading. What fun. Oh, I forgot but I got an official weigh-in today here at the hospital and I lost eighteen pounds since last month at this time. Man, and I eat like a horse on the Camino! 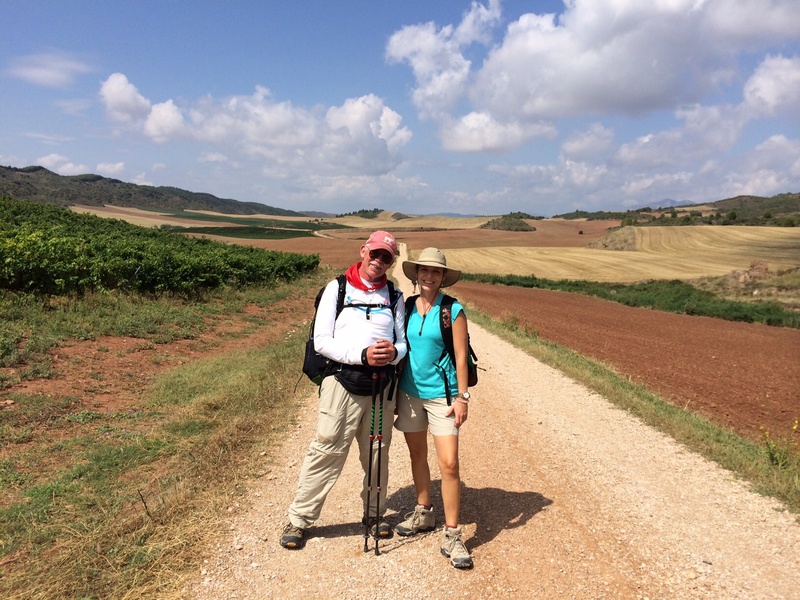 “It is the time when all the presents that the Camino gave us will become useful.” That’s Lucia from Sicily. I like it. Let’s think about that. Love you guys, Phil. Home for the night and then off again to Swedish Hospital now. Am getting aboard the ferry and I will have twenty minutes to hammer out a post. Well, just had to talk to two people about the trip. I spent way too much time on planes yesterday. Did the whole trip from Santiago to Madrid to NYC to Seattle in one long day. At one point was lost in the airport in Madrid and was saved by A Camino Angel that I met earlier. Had some fresh corn from our crop for lunch today. Harvest time. Is the best time of year, I think, and I am back for it. Everything around the ranch looks pretty good for not being touched for a month. I will sort through my pix and try and get some more out. Maybe Todd and Maryka you could try and get me some material. Thanks. OK, we are coming into the dock. Keep going, love, Phil. The promised land! Earlier we got our Compostela and just got out of the Pilgrim’s Mass. That was spectacular. There was Romanesque architecture complete with squinches. We had communion which was a general mob scene but good. There must have been a thousand people there. 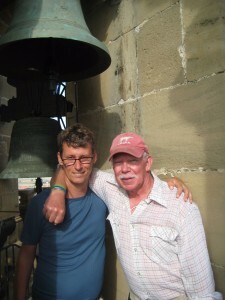 Then they did the big incense burner that swings the length and height of the cathedral. So we are catching some food and drink before afternoon activities. I have to get back into the Cathedral to talk to St James which is the important thing. Have to pick up a few gifts here also. I am crawling at this point, pretty exhausted. Have the feeling that I will collapse when I let myself. Will be on the plane tomorrow and can sleep then. Angela Merkel (sp?) is here today and we have a meeting later today. Something about foreign policy. I’ll have get my people on it. I just went to a little informal Mass. It was just a priest and maybe twelve people gathered outside by the place we were eating. I just walked over and joined them and they welcomed me warmly. It was beautiful and simple. We are off to do some filming at sunset with the Cathedral in the distance. OK, love you all, Phil. Alida and me back some weeks ago. That’s just a beautiful photo in it’s composition, don’t you think? Maryka helped me transfer it to the blog from email. I have trouble with such simple maneuvers. Thank you Alida, thank you Maryka. I completed my petitions for St James for tomorrow. This is a method that Clara described and involves having four candidates and letting St James pick what he wants to pick. OK, I’m with the program, so: 1. I am asking for a blessing for our world that we may continue to work toward reconciliation and peace. 2. A blessing for the people of Spain for hosting us on our Camino. 3. A blessing for my family, doctors, nurses, angels, friends and advisors that have supported me on my journey. 4. A blessing for my personal Camino wherever it goes from here and for all those who carry a cancer burden. There that looks pretty darn good. OK, I am going to post this and I will work on getting some more pix ready. Later, love, Phil.